In the early days rowing boats were built for carrying their cargo and were all of heavy displacement relative to their size. All were built of wood. Once rowing became a leisure activity greater thought was given to displacement and hull efficiency. The boat for th e first men's Varsity Boat Race of 1829 was a wooden cutter-style eight with in-riggers with wooden thole pins and a leather or rope thole to hold the oar, with the rower sitting on the opposite side of the boat to his oar. When CUWBC first took to the water in the early 1940s wood was still the construction material for their clinker boats, which were robust in construction and normally built with cedar or mahogany strakes or planks on oak frames all held together with copper nails. The saxboards were usually made of mahogany. Once the cutting tools and glues became available it was possible to construct shell boats from thin cedar deals making the hull considerably lighter than clinkers. A balance between the slimness of the hull and stability needs to be achieved and the semi-circular wetted cross-section gave the minimum surface area to volume ratio, thus minimising friction in the water. Shells require more skill from a rower to balance them and more careful maintenance and handling. The real revolution in boat building was the introduction of fibreglass mouldings which could produce more complicated shapes. However the use of early plastics did not last long because of the sensitivity to temperature of the plastic and the fact that it became over-pliable on a hot day. Plastic construction was soon replaced by monocoque hull construction using the more expensive and considerably stronger carbon fibre over a Lightweight honeycomb Kevlar core. 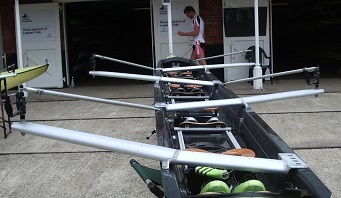 CUWBC had its first fibreglass eight in 1984 and thereafter rowed in carbocraft boats. 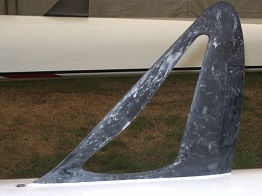 Moulded hulls offered the opportunity to modify the hull design, while at the same time maintaining the strength in the hull to withstand the external forces and keeping the weight to a minimum. All designs aimed to minimise air and water friction. Outriggers, which were intro duced by Harry Clasper and J W Conant in 1845, allowed hulls to become narrower, lighter and faster. This was demonstrated by Dr Furnival with his sculling boats in the 1800s. The introduction by Mike Davies in 1874 of swivel rowlocks made of iron, which then changed to brass in the 1920s and to plastic in the 1970s made a much easier pivot for the oar than the flexible thole and pin. In due course everything became adjustable, the buttons could be moved up or down the oar shank and the rigger height could be adjusted to suit the size and weight of the oarsperson. In the mid 1980s Empacher brought out the adjustable pitch oar lock, while the modern Concept2 oar lock which allows the gearing on the rigger to be adjusted according to the fitness of the oarsperson was developed in the 1990s. Carbon fibre found its way into rigger design too. Wing riggers now form the structural cross member of the boat and riggers no longer need the multiple shoulder supports going back into the saxboard. The new millennium then saw the introduction of an aerodynamic tube rigger developed by Sims. Sliding seats were introduced by John Babcock in 1857, a sophisticated development from the rower having to slide over a well-varnished platform in his leather trousers. A further evolution was the invention of the wooden seat on wheels and metal sliders designed by Dr Schiller in 1863 and since then this has been further developed using modern materials to minimise friction. The other most radical change has been in rudder design. 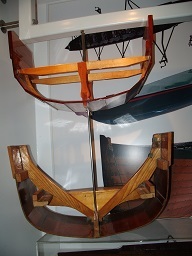 The traditional wooden rudder was the depth of the hull and controlled by strings fixed onto the top of the rudder post. Today the rudder is a small tab fixed to the keel and could be covered by just 3–4 postage stamps. The keel itself is just a hollow triangle. This adds increased efficiency through reduced air and water friction. These rudders are quite adequate for rowing a course on a rowing lake, but for a narrow winding river like the Cam the small rudder requires more forward anticipation of a bend in the river from the cox, and of course they are useless as presentation pieces inscribed with names. 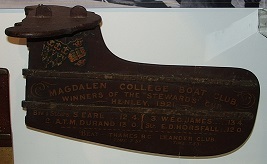 It was traditional to present a rudder (from a disused boat), inscribed with the names of the crew (for which there was plenty of space) to the cox of a winning crew just as an inscribed oar is presented to each oarsperson in the crew winning Head of the River or gaining four bumps in the bumping races.